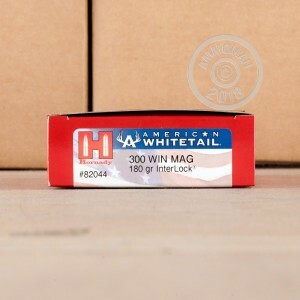 This .300 Winchester Magnum ammunition from Hornady offers deadly performance optimized for taking whitetail deer, though it also excels against other midsize and large game animals as well. 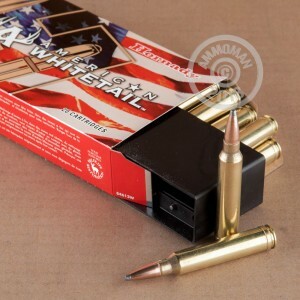 Each cartridge in this box of 20 contains a 180 grain Hornady Interlock soft point bullet to a muzzle velocity of 2,960 feet per second. The Interlock bullet offers excellent weight retention due to its locking ring, which keeps the core and jacket together during the mushrooming process. As a soft point projectile, the Interlock expands without excessive fragmentation and meat loss, making it ideal for hunting. 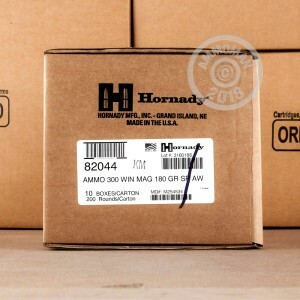 American Whitetail ammunition is loaded at Hornady's headquarters in Grand Island, Nebraska using non-corrosive primers and brass cases.